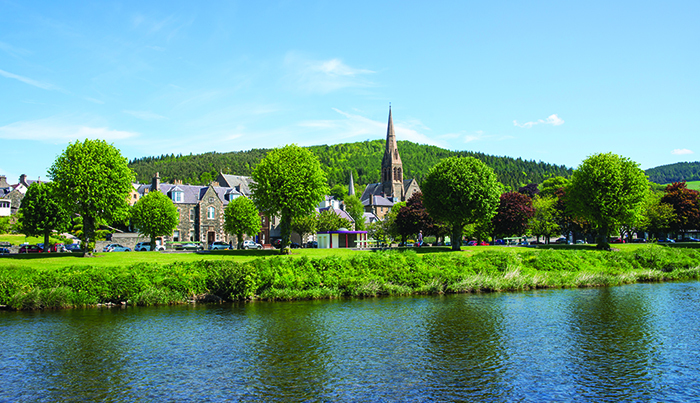 From a five-span stone bridge in Peebles, I watched the River Tweed flow through this market town, lively with shoppers and al fresco coffee drinkers enjoying a hot summer’s day. 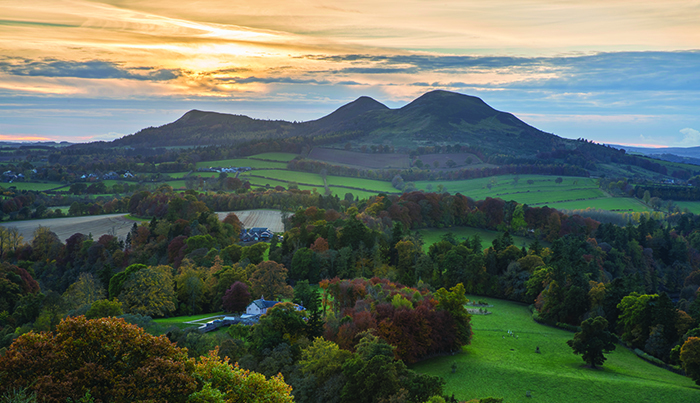 Touring less than 25 miles south of the capital city of Edinburgh, the River Tweed, one of Britain’s great salmon rivers, was never far from sight, whether from a waterside town or an elevated vantage point, such as Scott’s View. From this beauty spot, accessible from a layby signposted off the A68 east of Melrose, the Tweed’s silvery course threaded through a vista of upright pines and buttercup-strewn fields. The Eildon Hills rose in the distance under an almost cloudless sky. The roads, incidentally, hemmed with wild rose, were almost deserted. Smugly, I thought of heaving summertime traffic in the south of England. Then there was walking the riverbank, to the chuckle of water over stones, dipping my toes in the cool depths. I did that in the grounds at Abbotsford, the 19th-century Scottish Baronial-style home completed for Sir Walter Scott in 1824. The literary titan, whose classics include Rob Roy and Ivanhoe, was also an antiquarian and collector. 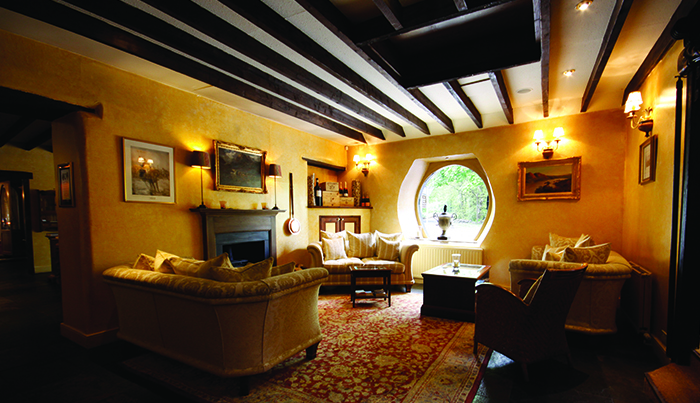 The house is a treasure box. 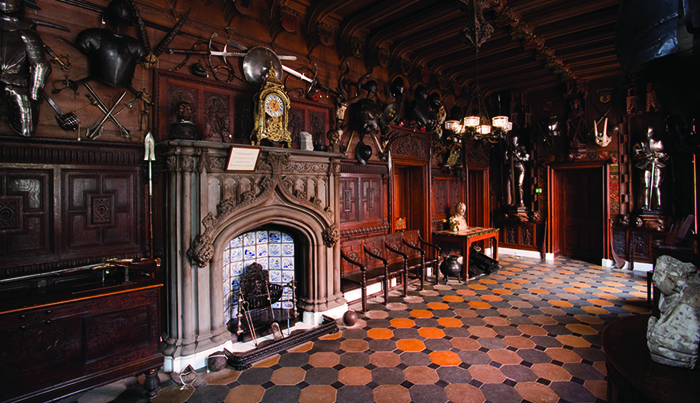 Shafts of sunlight pierce the entrance hall’s gloom, illuminating panelling of black oak, coats of arms and an ornate stone fireplace. In the Study, the very desk at which Scott wrote, made by Gillow of London, sits beneath a gallery of leather-bound books. More tomes, in staggering number, each and every one collected by Scott, line the Library’s expanse, then the Drawing Room, hung with exquisite hand-painted Chinese wallpaper. The Dining Room is where he breathed his last, lying on a little bed made up for him beside a window from which he could see his beloved river course by. 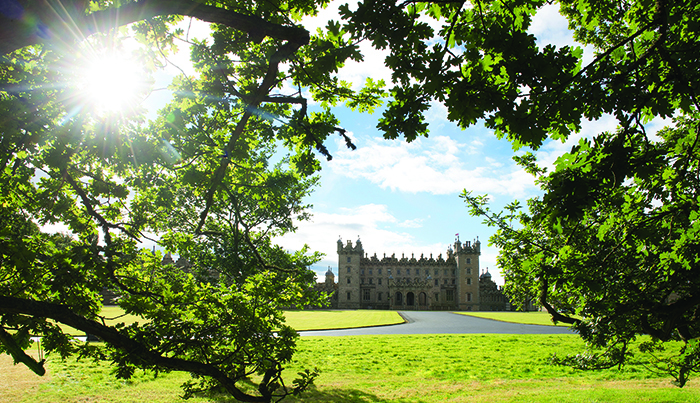 In 2013, Abbotsford reopened after a multi-million pound restoration which included a bold, modern visitor centre and café. Despite sandwiches plump with Scottish smoked salmon and salads of chargrilled chicken, ribboned vegetables and toasted nuts, justice could barely be done, having eaten a breakfast of champions that morning at The Horseshoe. 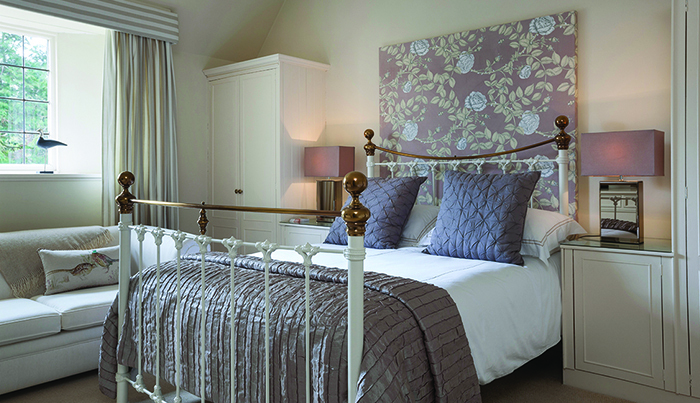 This roadside inn, less than one hour south of Edinburgh Airport, delivered a pleasantly simple bedroom in a converted schoolhouse tucked behind the restaurant. Freshly squeezed juice kicked off the day along with homemade yoghurt and granola, brioche French toast with maple syrup, and undyed smoked haddock with a poached egg and potato scone. 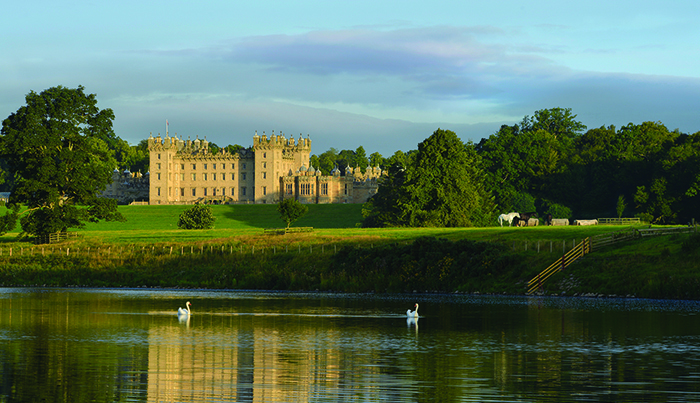 From Abbotsford, I hit the (empty) road again, to Floors Castle, near Kelso, ancestral home of the Duke of Roxburghe. 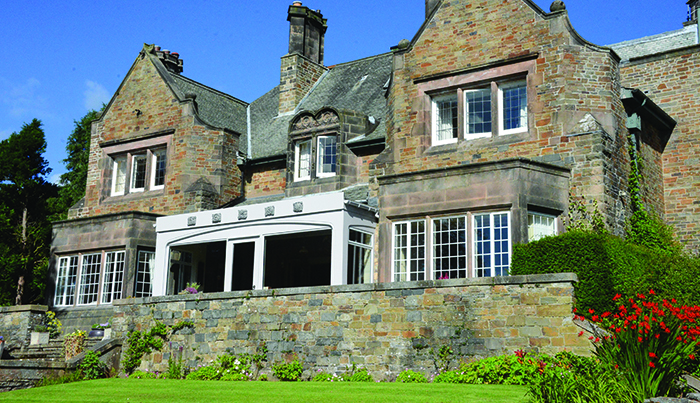 Built almost a century earlier than Abbotsford, extended a century later, it is, as one would expect, very grand indeed. 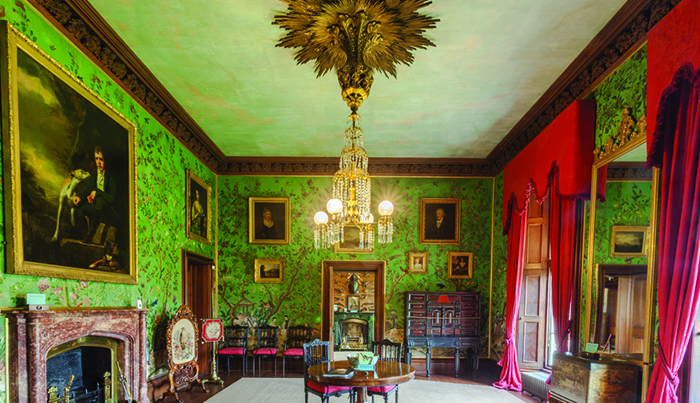 Scooting in, ahead of a coach party, I discovered 18th-century tapestry, a fabulously pink sitting room, paintings by Augustus John and Matisse, and a taxidermist’s dream in the curiously eccentric Bird Room. Next overnight stop was Windlestraw, at Walkerburn. 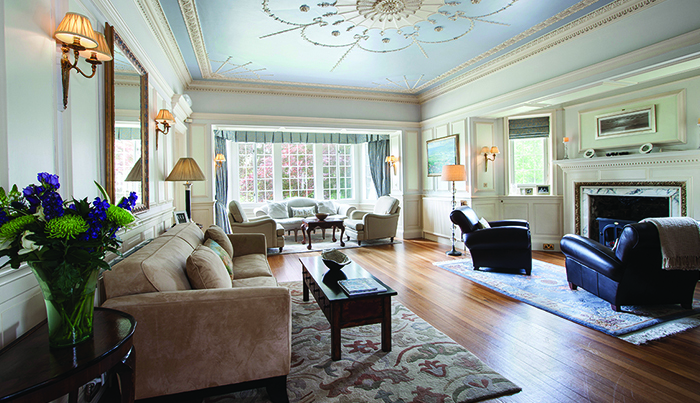 Unassumingly billed as a B&B, set dinner is offered at this Edwardian manor and proved a highlight. In midsummer, the light had yet to fade as delicate canapes were served with drinks on the terrace looking out across smudgy distant hills. Dinner of impeccable sourcing followed – roast cod, broad beans, chard, fresh almonds, and loin of lamb, peas and lardons – all served with the same confident style as the interiors. The next day, I tapped Hawick into the satnav. The fortunes of the largest of the Border towns has ebbed and flowed. Right now there is tide-turning energy. There is a heritage butchers, Going Native, The Three Stills Company will open The Borders Distillery and visitor centre by the end of 2017, and I heard that someone has acquired the beautiful, derelict (cashmere company) N. Peal building. 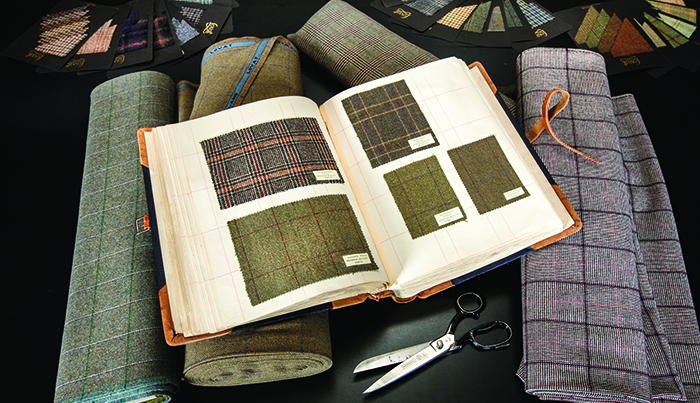 Hawick is still a world textile centre. 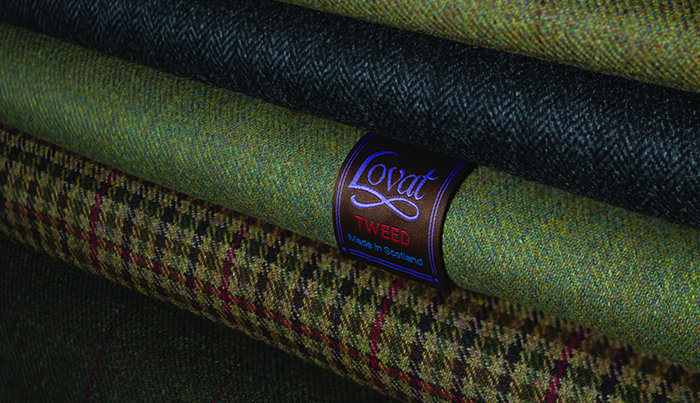 At Lovat Mill, delicious tweed is woven for Scottish estates, fashion houses such as Chanel and Henry Holland, or simply your next suit. 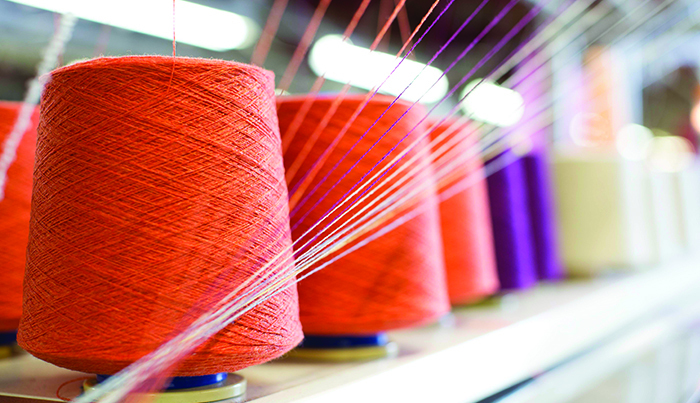 Johnstons has cashmere of every hue, discount prices and factory tours revealing meticulous production. A semi-retired staff member recounted starting as a machinist at 15, and described the town in the Fifties as packed with coffee houses and Italian ice cream parlours. Revival is on the cards, and so, too, is a return visit.